Hello everyone! You are officially invited to a Garden Party, and it’s going on right here! It’s that time of month when the All Things Creative Team brings you the best of their ideas related to a monthly theme and you guessed it-this month’s theme is Gardening! If you’re anything like me, you’ve been itching to get out and play in the dirt for a few months. Finally the weather is cooperating so that we can get some things planted and blooming. Speaking of blooming, I thought I’d share our roses with you. 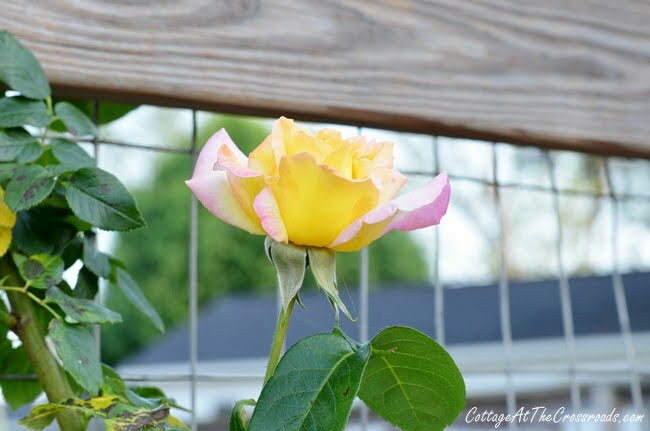 When we started our garden 5 years ago, we put up a tall fence and planted roses along the front side of it. Most of the roses were Knockout roses, and a few of them were climbers. And they have just started blooming this past week. The yellow Knockouts are especially pretty this spring. I did fertilize all the roses about a month ago. 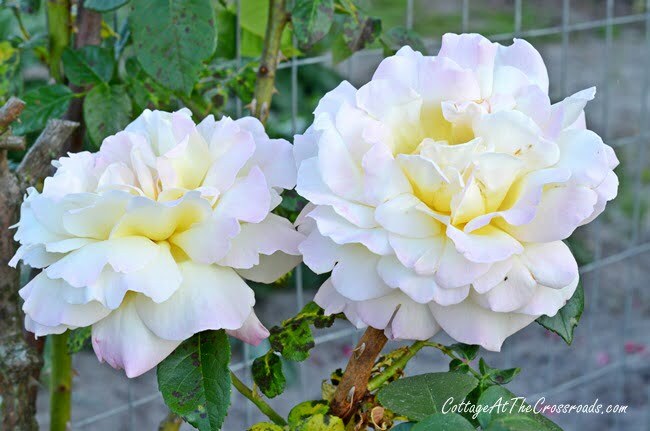 But my favorite climber is the Peace rose. 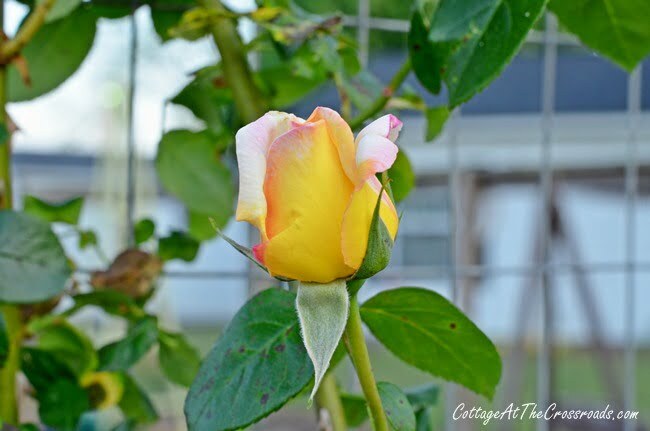 I love how the bud is yellow with a blush of pink on its tips. And then the yellow becomes softer as the bud opens. And then unfurls into a fluffy, creamy yellow. I can see some evidence of the dreaded blackspot on the leaves of this rose so I’ll start treatment on it tomorrow. 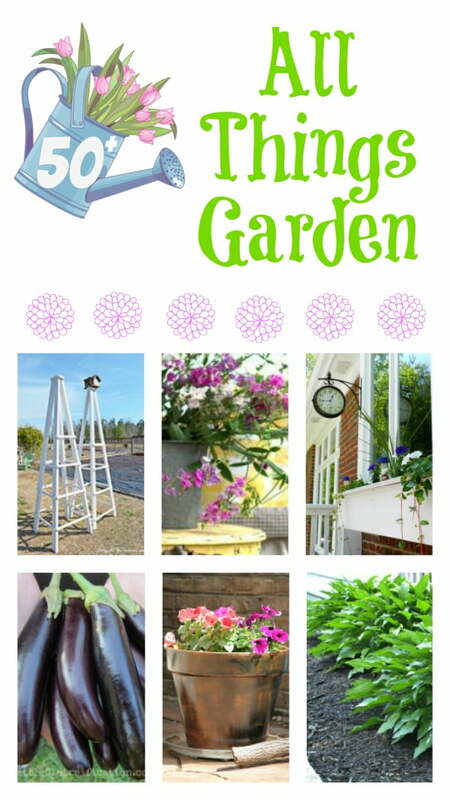 Click on any of the links below to get plenty of gardening inspiration! Jane your garden is beautiful!! 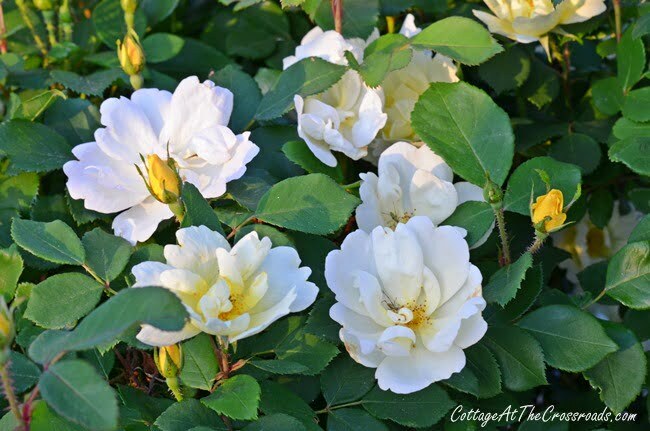 I love knock out roses too – I need to get some more. You definitely have a green thumb, my friend! Pinned! I just love knock out roses. I have got to get me some! Your garden is lovely. I’m not much of a green thumb as I would like to be. That was my mother! Thanks for sharing all the links! Can’t wait to look through them and get some great ideas! Jane, I’m not familiar with Peace roses. I love their transformation and how they change as they bloom! 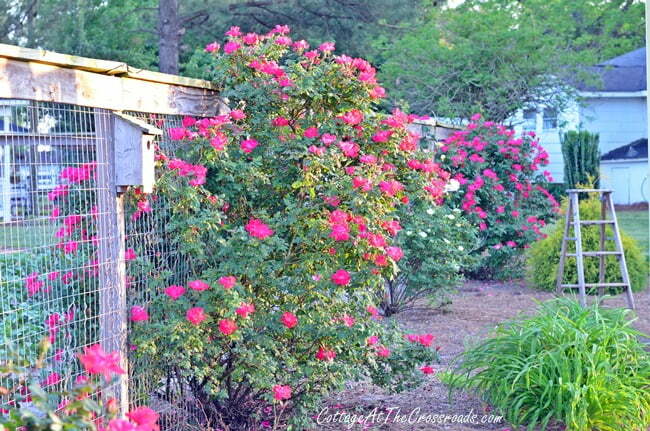 Oh how I love your garden and the roses are beautiful…you have my favorite roses…the Peace and the yellow knockouts…We have to spray our knockouts often so the deer will not have them for dessert…The rose garden along the fence is gorgeous!! Oh my, your roses are so beautiful! Thanx for showing them. What a wonderful group!!! 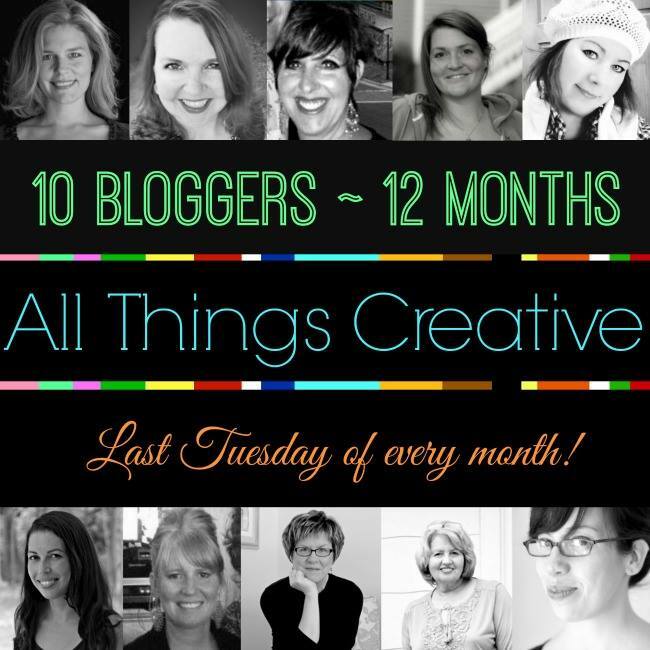 I love that I can get all this great garden wisdom from some of my favorite bloggers! Thanks so much! LOVE peace roses! Don’t have very good luck with them the beetles eat them. Any ideas? Jane, I can’t believe you have so many things blooming right now. We just had the grass turn green here. Your space is just lovely! Good morning, Jane! The Peace Rose is beautiful! Thanks for sharing!